Bangui is the caipital o an the lairgest ceety in the Central African Republic. The majority o the population o the Central African Republic lives in the wastren pairts o the kintra, near Bangui. Tho locatit athin Ombella-M'Poko prefectur, it is an independent commune, an sicweys poleetically independent o the surroondin prefectur. The ceety wis foondit in 1889 in wha wis then the French colony Haut-Oubangui ('Upper Ubangi'), later renamed Oubangui-Chari an made pairt o French Equatorial Africae. Named for local rapids, the ceety grew aroond the French military post on the Ubangi river. Bangui served as an admeenistration centre in the colonial era an continues tae be the admeenistrative centre o the CAR. Widespread violence in Bangui follaed the Mairch 1981 elections, which teuk place follaein a French operation tae depose Jean-Bédel Bokassa in 1979 an replace him wi David Dacko. Opponents o the unpopular Dacko laid siege tae Bangui an compelled his flicht tae exile. Andre Kolingba then formed the Comité Militaire pour le Redressement National (See History o the Central African Republic. In October 1985, a conference of public heal officials includin representatives o the Centers for Disease Control an Warld Halth Organisation met in Bangui an defined AIDS in Africae as, "prolonged fevers for a month or mair, weight loss o ower 10% an prolonged diarrhoea". Aboot hauf the AIDS cases in Africae based on the Bangui definition are HIV positive. A French Jaguar aircraft crashed in Bangui in Mairch 1986, killin 35 an leadin tae a resurgence in anti-French sentiment. Andre Kolingba, housomeivver, continued tae allou the French tae maintain military bases in the Central African Republic. Some 200 Central African Republic sodgers mutinied in Bangui in Mey 1996, demandin back pey an the resignation o Preses Ange-Félix Patassé. French troops stationed in the kintra quelled the mutiny. The renegades, housomeivver, heavily luitit Bangui an killed mair nor 50 fowk. Efter Preses Patassé annoonced a naitional unity govrenment in early 1997, mutinous troops refused tae relinquish a military base in Bangui. New fechtin eruptit in Juin. Rebel leader François Bozizé teuk pouer bi seizin Bangui in Mairch 2003, oostin Patasse. The situation in the toun is nou improvin, but regular instability is bein noticed. Mercer Human Resoorces Consulting named Bangui as the 214t worst ceety oot of 215 in thair 2009 quality o livin survey. Baghdad wis the anerlie ceety tae be ranked lawer than Bangui. Ubangi (Oubangui) River at the ootskirts o Bangui. Bangui lies on the northren banks o the Ubangi River juist belaw a series o rapids that leemit major commercial shippin farther upriver, on the soothren border. The navigable Ubangi River turns shairply sooth belaw Bangui an connects tae the Congo River juist sooth o the equator near Brazzaville as its chief northren tributary. The river marks the mairch atween the Central African Republic an the Democratic Republic o the Congo (DRC). The Congolese toun o Zongo sits opposite the river frae Bangui. The ceety centre lies near the river an features a lairge triumphal airch dedicatit tae Bokassa, the Presidential Palace an the central mercat. Lyin 5 km further north, the hert o the residential aurie haes the lairgest mercat an maist nichtlife. North o the ceety lie rollin hills. The Central African Republic is situatit juist north o the Equator an consequently throughoot the year daily heich temperatures rarely faw belaw the heich 80s Fahrenheit. Bangui features a tropical wet an dry climate. The rainy saison lasts frae Mey till October. Bangui, bein in the sooth o the kintra an sicweys closest tae the equator, is slichtly hetter an wetter than the northren pairts o the kintra. Several o the neighborhuids o Bangui are in law-lyin auries an are prone tae recurrent urban floodin. For instance, severe rains in Juin an Julie 2009 left 11,000 fowk hameless. 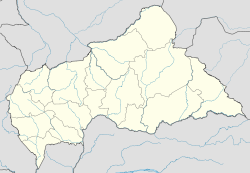 Bangui is an autonomous commune (commune autonome) o the Central African Republic. Wi an aurie o 67 km², it is bi far the smawest heich-level admeenistrative diveesion o the CAR in aurie but the heichest in population. The ceety o Bangui consists o 8 urban destricts (‘arrondissements’), 16 groups (‘groupements’) an 205 neighborhuids (‘quartiers’). Bangui serves as an admeenistrative, tred, an commercial centre. It received its first baunk branch in 1946 when the Bank of West Africa (BAO) established a branch thare. Bangui manufactures include textiles, fuid products, beer, shuin, an saip. The main exports are cotton, timmer, coffee, an sisal. Acause o the ongoin strife, unemployment hovered near 23% in the ceety. 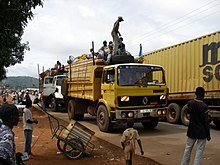 Bangui hosts a river port an is served bi Bangui M'Poko International Airport (IATA airport code BGF); the umwhile handles the owerwhelmin majority o the kintra's internaitional tred. River ferries sail tae Brazzaville an Zongo. Roads connect the ceety tae Cameroon, Chad, an Sudan. Twa GSM-900 mobile telecommunications companies, Telecel CAR an Nationlink Telecom RCA, operate oot o Bangui. State-awned Socatel is the principal telecom in CAR an Bangui, an is responsible for the operation an maintenance o the communications infrastructur. A French boulangerie in Bangui. Thare are three types o restaurants in Bangui. First, those wi French orientation, awtho thay mey hae African ambiance an/or some African fuid. Thir include "Relais des Chasses", "L'Equateur", "Tropicana", an "L'Escale". Seicont, thare are restaurants focusin on foreign cuisine, sic as the Lebanese "Ali Baba" an "Beyrouth", an a Cheenese restaurant simply kent as "Chinese Restaurant". Third, thare are numerous African restaurants vera popular especially amang locals, which include the celebratit "Madame M'boka". A nummer o bars an street fuid staws an aa complement Bangui's culinary scene. Several periodicals an three daily newspapers publish in Bangui. Ither attractions in Bangui include Boganda Museum an Bokassa Palace. The Cathédrale Notre-Dame in Bangui is the seat o the Roman Catholic Airchdiocese o Bangui. Airchaeological studies in an aroond the ceety hae yieldit at least 26 auncient Iron Age steids that contain mony metallurgical tuils an objects, illuminatin the pre-European history o the ceety an surroondin aurie. Thir airchaeological steids wur addit tae the UNESCO Warld Heritage Steid Tentative Leet on 11 Aprile 2006 in the Cultural category. Bangui is hame tae the University o Bangui, foondit in 1970. A public institution, the University o Bangui monopolizes non-agricultural college eddication in the Central African Republic. ↑ 1.0 1.1 "Bangui". World Gazetteer. Retrieved 30 March 2013. ↑ "World66 - Bangui travel guide". ↑ "BBC - World Weather - Average Conditions - Central African Republic". Archived frae the oreeginal on 2007-10-21. 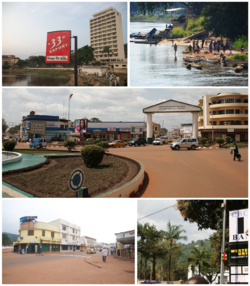 ↑ "Lonely Planet Destination Guide - Bangui Weather". ↑ "Centrafrique/inondations à Bangui: près de 11.000 sans-abri, selon un nouveau bilan". Jeune Afrique (in French). 7 July 2009. ↑ "Statoids - Central African Republic". ↑ "Profil Socioéconomique de la Ville de Bangui". ↑ 10.0 10.1 "Les sites paléo-métallurgiques de Bangui - UNESCO World Heritage Centre". ↑ "University of Bangui Official Site". Wikimedia Commons haes media relatit tae Bangui.